Today I have the pleasure of sharing one of our artist's stories with you. 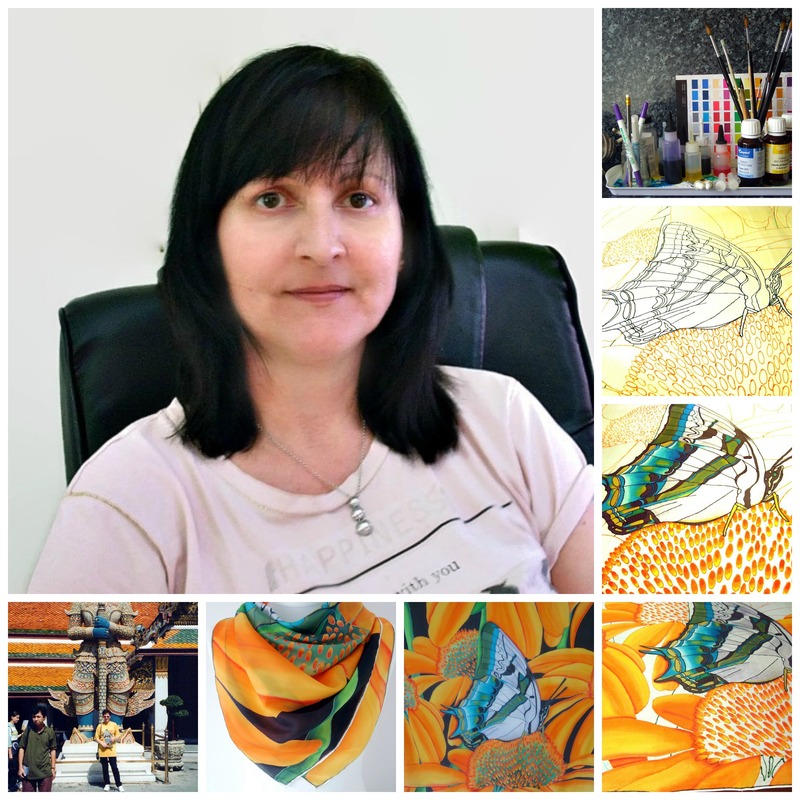 Meet Joanne Raines with beautiful story on how she found silk painting. How did I discover Silk Painting? Well it was the summer of 1998, my husband and I were on vacation in Thailand. We'd spent 3 busy days in Bangkok visiting as many sights as possible and were now on the island of Phuket. The minute we landed on the island I felt really queasy and it wouldn't go away, then it clicked, "I must be pregnant" I got one of the waiters to bring me some raw ginger to help with the symptoms. After a few days and my repeated requests for ginger the waiter said if I needed any more to go through into the back kitchens myself and ask one of the chefs. The first time I went through the staff doors it opened onto an enclosed courtyard, and that's when I spotted a young woman with her silk painting in progress. I got the ginger then returned to ask the woman if I could watch her for a while, I don't think she understood me but she didn't send me on my way. She was painting a beautiful landscape scene with birds and butterfly's and I knew right then I would have to try it for myself. When we returned to the UK I did as much research as I could before ordering the necessary supplies to give it a go. I'd always been into arts and crafts but never trained in any. I'm a beauty therapist by trade. The very first piece I did was on a spare bit of silk about the size of a handkerchief and was a pink water lily, I made a decent enough job of it for a first attempt and that was it, hooked!. P.S Yes I was pregnant and had my daughter in February 99, she's a much better artist than I'll ever be. Thanks Joanne for sharing that beautiful story with us.